17 HONDIUS, H. / JANSSON, J. Asia recens summa cura delineata. Amsterdam, 1631 [1639-1649. Beau col. d'�poque. Bel exemplaire. - A very good copy. 372 x 494 mm. � Texte en fran�ais au verso. - Henricus Hondius' fine and decorative map of the continent of Asia depicting a refined Japan and Korea. 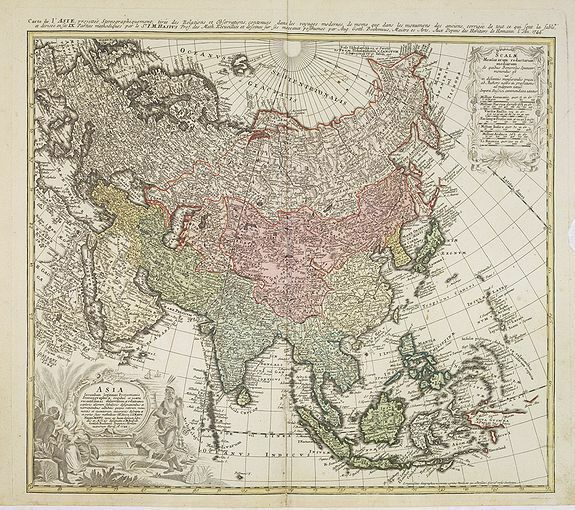 - Sweet, Mapping of the continent of Asia, 33. 18 HOMANN, H�ritiers. Asia. Nuremberg, 1744. Col. d'�poque. Pli central restaur� dans sa partie inf�rieure sur 10 cm. Petit manque de papier dans la marge droite. - Repair of split lower part centerfold 10 cm into engraved area, loss of paper in the right margin. 470 x 552 mm. 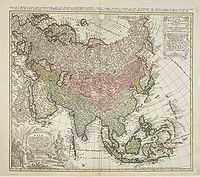 � Johann Baptist Homann's well-engraved map of Asia has a large decorative cartouche. Johann Baptist Homann (1663-1724) was a German engraver and publisher, who established himself and his family as perhaps the most famous German map publishers. Following his death in 1724, the business continued under the name "Homann Heirs". 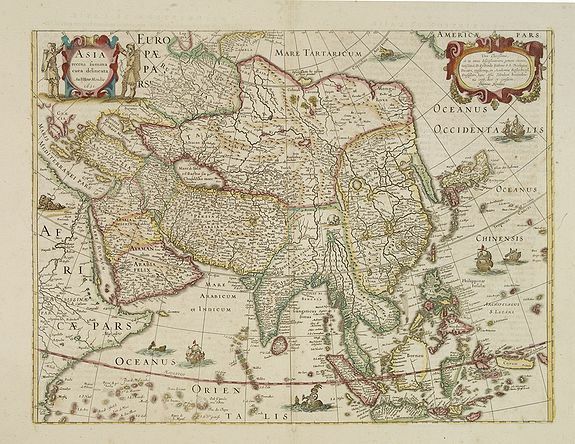 This Homann map is finely engraved, and in original wash colour and a uncoloured cartouche.